The Royal Kona Resort was where the action was during day one of First Annual Tiki Festival, Hawai‘i Island, on Thursday, Nov. 16, and runs through Saturday, Nov. 18, 2017. Entertainer and Promoter Paul “Kozy” Kozak was Thursday night’s master of ceremonies and fans will get a chance to be dazzled by him on the final nights of the festival. 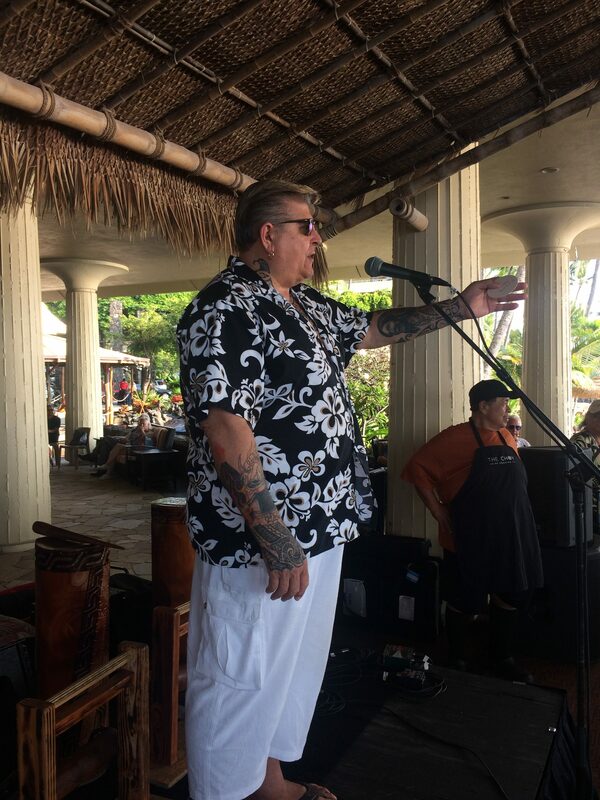 Paul “Kozy” Kozak entertains the crowd on day one of the First Annual Tiki Festival, Hawai‘i Island, on Thursday, Nov. 16, 2017. Big Island Now photo. Hundreds of tiki lovers from all over the island got a chance to meet, greet and purchase tiki art from some of the globally renowned artists that were on hand, such as Brad “Tiki Shark” Parker. Brad “Tiki Shark” Parker signs an art piece for a fan on day one of the First Annual Tiki Festival, Hawai‘i Island, on Thursday, Nov. 16, 2017. Big Island Now photo. 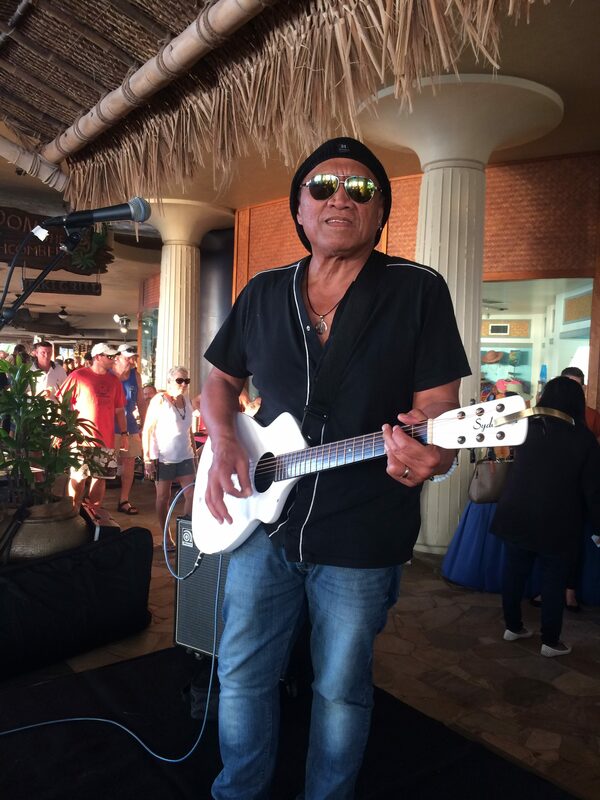 Fans got to relax at the Don the Beachcombers Lounge at the resort while listening to the music of Grammy-nominated musician Henry Kapono. Henry Kapono had the fans rocking on day one of the First Annual Tiki Festival, Hawai‘i Island, on Thursday, Nov. 16, 2017. Big Island Now photo..
Celebrity Chef Sam Choy was on hand as well. Samples of his world-famous poke were quickly snatched up by festivalgoers. 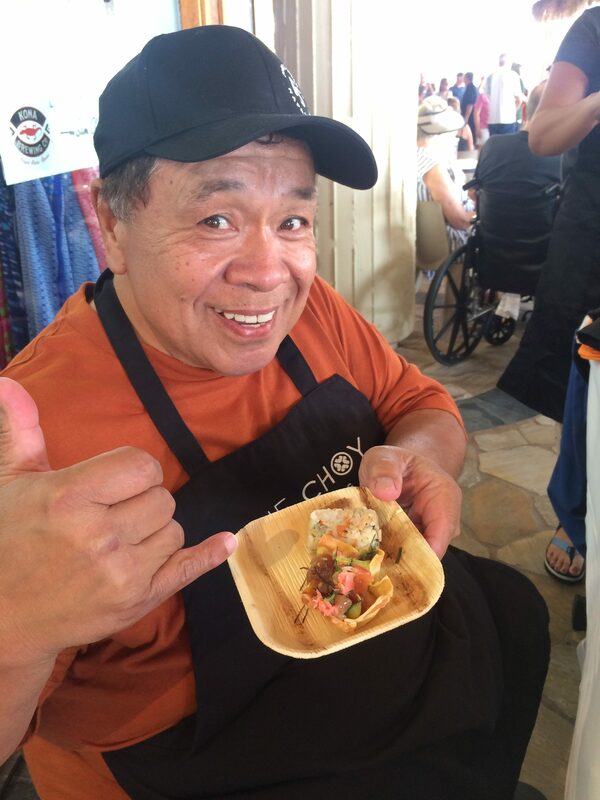 Sam Choy and his world famous poke on day one of the First Annual Tiki Festival, Hawai‘i Island, on Thursday, Nov. 16, 2017. 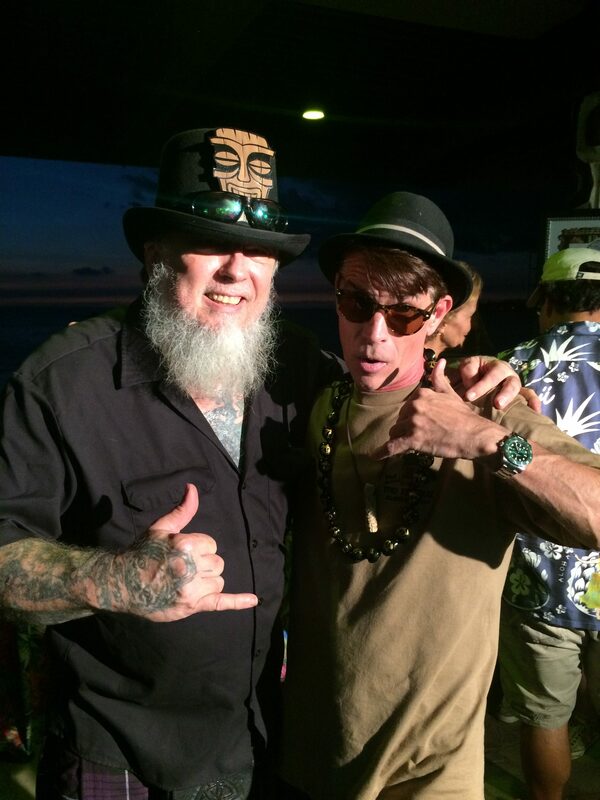 Big Island Now photo..
World famous Tattoo Artist Rockwood Ricc was on-hand. 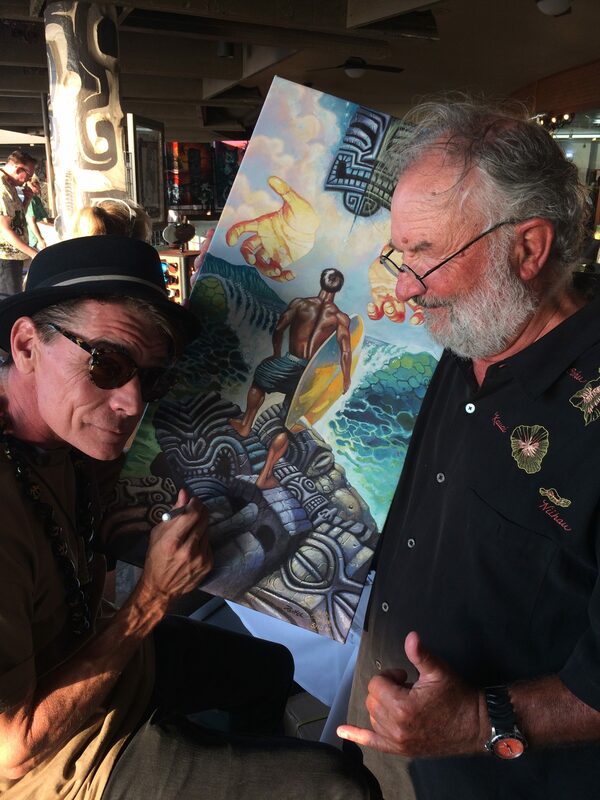 Rockwood Ricc and Brad “Tiki Shark” Parker, two of the Big Islands most talented artists, participated on day one of the First Annual Tiki Festival, Hawai‘i Island, on Thursday, Nov. 16, 2017. 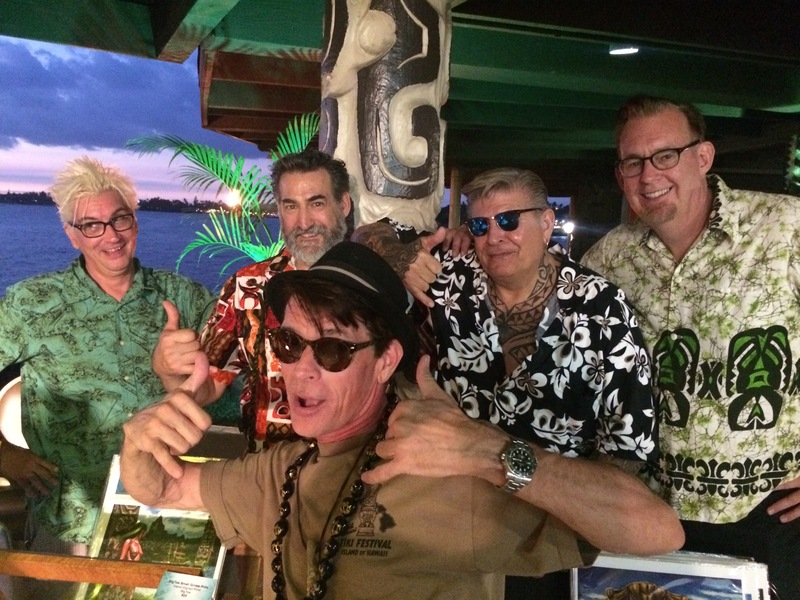 Big Island Now photo..
(L–R) Ken Ruznic, “Big Toe,” Parker,Paul “Kozy” Kozak and Doug Horne on day one of the First Annual Tiki Festival, Hawai‘i Island, on Thursday, Nov. 16, 2017. Big Island Now photo. “It’s an honor to be able to bring these high-profile artists to the island for all to enjoy,” said Tiki Shark Parker. The festival continues on Saturday at The Shops at Mauna Lani, where attendees can enjoy 40 vendors, two tiki bars, food, dance, two bands, and art sales and demonstrations.